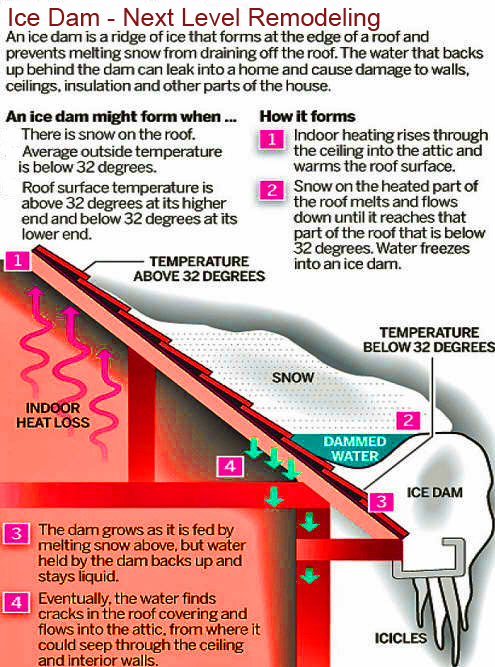 -Before you read on, make sure to take a look at the illustration to understand what causes ice dams. It sounds backwards, but the best way to prevent an ice dam is to keep your roof cold! This will allow the snow or ice to melt slowly and dissipate more evenly and controlled. Make sure your attic is properly insulated and all gaps that let warm air from your living space are sealed. This is the main cause of ice damming. You attic also must remain well ventilated to allow that warm air to escape. Although excess heat moving from the attic through the roof rapidly melts snow, once the melt water touches the freezing cold eaves, it quickly forms an ice dam. If you already have an ice dam forming, make sure to call a professional to remove and fix the issue. Remember that prevention is key. If you are unsure that your homes existing conditions are setup to prevent ice damming and other cold related problems, call now. A consultation costs you nothing, but water backing up into your home could cost you dearly.